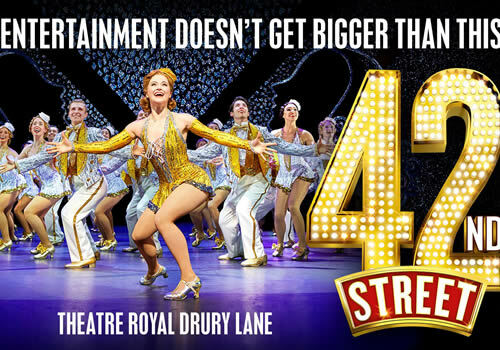 Bonnie Langford stars in the multi-award winning musical 42nd Street, playing in the West End's Theatre Royal Drury Lane. 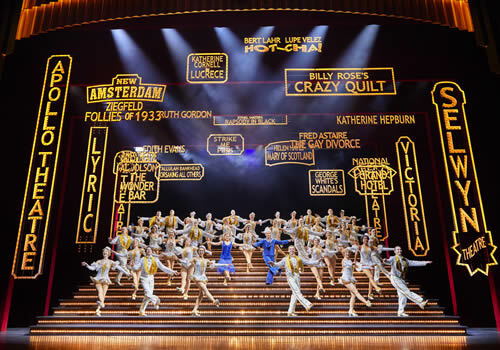 Featuring a cast of 50 fabulous singers and dancers, this revival of a Broadway classic continues to wow audiences with its timeless songs and titillating tap routines. Based on the classic American dream, 42nd Street follows young hopeful Peggy Sawyer, a small-town dancer who travels to New York with the hopes of becoming an actress. When Peggy lands a role in the chorus line of a new Broadway production, she dreams of playing a bigger part in the show. With a stroke of luck, the snappy, infamous leading actress gets injured, giving Peggy the opportunity to prove herself as a star of the stage. Featuring well-known songs such as “We’re in the Money”, “Lullaby of Broadway”, “Shuffle Off to Buffalo” and the toe-tapping “42nd Street”, this musical is sure to have audiences dancing in their seats! 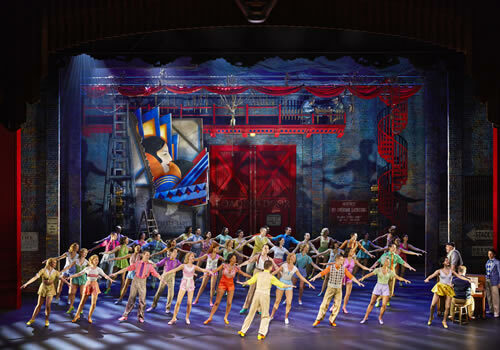 One of Broadway’s biggest and longest-running shows, 42nd Street originally opened at the Winter Garden Theatre, impressing audiences and critics alike. Revived in 2001 by Mark Bramble on Broadway, and once again in 2015 for a US tour, 42nd Street returned in 2017. Adapted into a well-known 1933 Hollywood film starring Ruby Keeler and Ginger Rogers, the musical is based on the novel by Bradford Ropes. Casting includes theatre and EastEnders legend Bonnie Langford as Dorothy Brock, alongside Clare Halse as Peggy Sawyer, Tom Lister as Julian Marsh and Ashley Day as Billy Lawlor. Further casting includes Jasna Ivir as Maggie, Graeme Henderson as Andy Lee, Christopher Howell as Bert Barry, Bruce Montague as Abner Dillon, Emma Caffrey as Anytime Annie, Matthew Goodgame as Pat Denning and Mark McKerracher as Mac/Doc/Thug. Ensemble members include Clare Rickard, Ella Martine, Hannah Amin, Lucy Andic, Sara Bispham, Pamela Blair, Abi Curruthers, Danielle Cato, Lisa Dent, Natasha Ferguson, Madeleine Francis, Maria Garrett, Maddie Harper, Leah Harris, Rebecca Herszenhorn, Bethany Huckle, Sarah Kacey, Annie Kitchen, Jenny Legg, Hannah–Faith Marram, Billie Kay, Katy Riches, Zoe Rogers, Jessica Stent, Josephina Camble, Gabrielle Cocca, Emma Johnson, Jasmine Kerr, Lucy Renouf, Christina Shard, Freddie Clements, Martin McCarthy, Zac Watts, Steph Parry, Thomas Audibert, George Beet, Philip Bertioli, Joel Cooper, Matt Cox, Adam Denman, Luke George, Ryan Gover, Alyn Hawke, Tom Partridge, James-Royden Lyley and Liam Wrate. 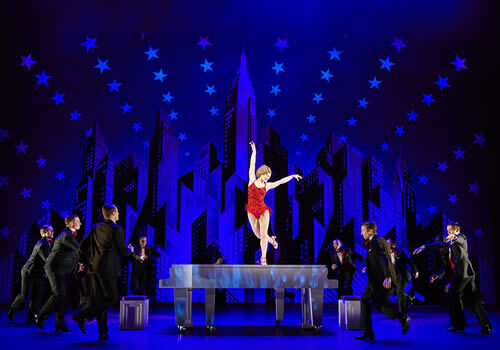 Directed by Mark Bramble, 42nd Street features a book co-authored by Bramble and Michael Stewart, with music by Harry Warren and lyrics by Al Dublin, as well as new choreography by Olivier Award-nominated Randy Skinner. A wonderful rags-to-riches story, this brand new, bigger than ever revival of the beloved musical plays at the Theatre Royal Drury Lane. 42nd Street is suitable for audiences of all ages, with an advisory age recommendation of ages 5 and up. All persons must hold a ticket and children under 4 will not be admitted into the auditorium. Under 15's must be seated next to an accompanying adult.